Carl Sassenrath is the founder and CTO of REBOL Technologies. He is best known for his original design and implementation of the Amiga Multitasking Operating System. Sassenrath grew-up in the town of Eureka in Northern California where he became interested in broadcast television and film production. In the early 70's he landed a job as a cameraman at the local ABC network affiliate and worked his way up to being a director before graduating from high school. It wasn't until Sassenrath attended the University of California, Davis, that he was first exposed to computers as a tool to help simulate brain function while he worked as a neuro-physiology research assistant. It was this work in neuroscience that inspired him toward inventing new methods of distributed computing in the years that followed. Before he graduated, Sassenrath was recruited in 1979 to the Hewlett Packard Computer Systems Division as an operating system engineer, during which time he also completed his degree at Davis and graduated with a B.S. in Electrical Engineering in 1980. At HP, he focused on the design and performance of HP's MPE operating system kernel. 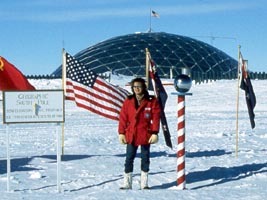 In 1981 Sassenrath took a break from HP and joined an Antarctic research team from Stanford University as a research scientist at the South Pole. Returning to HP in 1982, Sassenrath engineered one of the first graphically oriented user interfaces (GUI). Using a prototype of the Sun Workstation loaned to him by Stanford student Andy Bechtolsheim (cofounder of Sun Microsystems), he created a distributed computing system utilizing a bitmap display, icons, fonts, a mouse, hyperlinks, and remote procedure calls to database server. The resources provided at HP allowed Sassenrath to carefully study the design of every operating system of the day and develop new system concepts around parallel processing and distributed computing. When Amiga Computer, Inc. extended an invitation to Sassenrath in 1983, they promised that he could write whatever operating system he wanted for use in the new Amiga computer. It was an exciting challenge. The Amiga was originally intended as a video game machine, so the operating system had to be small and efficient as well as multitasking in order to support animation, graphics, sounds, and other functions occurring simultaneously. When the Commodore Amiga was released in 1985 it was the first multimedia personal computer on the market and featured a color graphical user interface, a two button mouse, a fast graphic subsystem, and support for animation and sound. After Amiga, Sassenrath joined Apple Computer Advanced Technology Group, where he lead the development of a next-generation object-oriented operating system for a secret parallel processing computer that was to eventually replace the Macintosh. In 1988, Sassenrath escaped from Silicon Valley lifestyle and bought a ranch in Northern California where he designed and built a house, planted a vineyard and now makes his own personal label of wine. Located in a small mountain community, Sassenrath has continued his pursuit of distributed system technologies by founding Pantaray, Inc., American Multimedia, and Videostream, Inc. - all of which provided various multimedia solutions, including Internet TV set-top boxes, CDTV (the world's first CD- ROM TV set-top box), and content authoring systems. In 1996, Sassenrath set aside all other work to focus solely on his vision of creating a new distributed computing architecture for the Internet, and he founded REBOL Technologies, located in Ukiah, California. REBOL offers a unique approach to distributing, sharing, and processing information across the Internet. At its core, REBOL is based on a special language technology that uses relative expressions to create dialects for intercommunication in much the same way that people communicate. The approach allows a computer to "understand" the meaning and how to interpret information sent from other computers. The result is a software technology that is not only many times more efficient and easier to use, but one that extends the Internet beyond web services to a simpler and more integrated model of distributed personal computing.